Hey hey! It’s Soup Swapper Saturday! 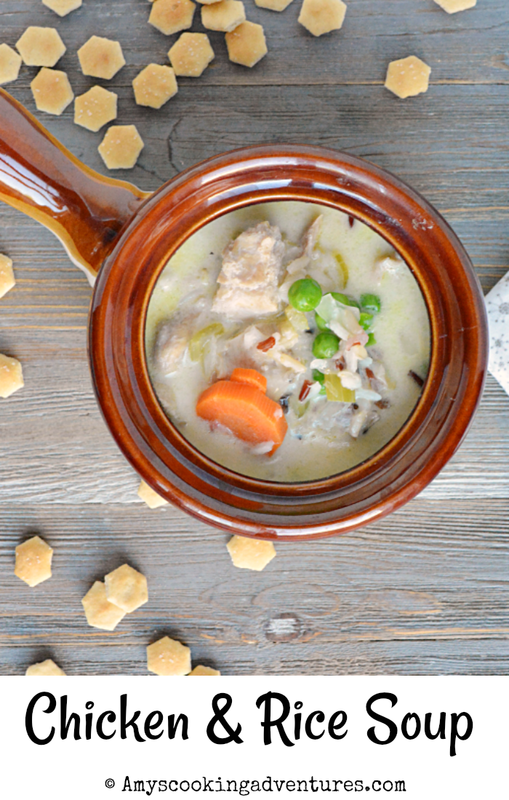 This month Ashley from Cheese Curd in Paradise who chose the theme: Regional Soups. The goal here is to whip up a soup that this local to your own state. 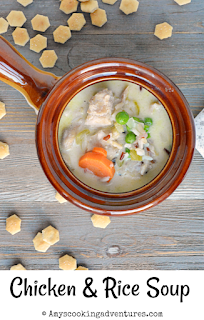 So I decided to make Chicken Wild Rice Soup – it’s so quintessentially midwestern! Here’s the thing though – wild rice is kind of expensive and fussy to make, so I’ve started making my own twist on the soup and adding a rice medley. It involves par-cooked rice (that’s the only reasonable explanation for a rice medley that takes only 15 minutes to cook) so it’s super fast and super delicious. I start with raw chicken that is poached in the broth as the rice cooks, but you could totally use leftover cooked chicken (or a store bought rotisserie chicken) to make this delicious, flavorful recipe go faster yet. And if you have a little more time on your hands, you should definitely give this version a try --> Chicken & Wild Rice Soup with Bacon. Scroll past the recipe to see what other recipes the soup swappers brought to the table today! Place the butter in a soup pot over medium heat. Add the onions, celery and carrots and cook until tender. Season with salt and pepper. Stir in the chicken, broth, and rice. Cook for 20 minutes or until chicken is cooked through and rice is tender. Stir in the peas and half and half. Heat through and serve. Place the butter in a soup pot over medium heat. Add the onions, celery and carrots and cook until tender. Season with salt and pepper. Stir in the chicken, broth, and rice. Cook for 20 minutes or until chicken is cooked through and rice is tender. Stir in the peas and half and half. Heat through and serve. There is a lot of comfort in that bowl! 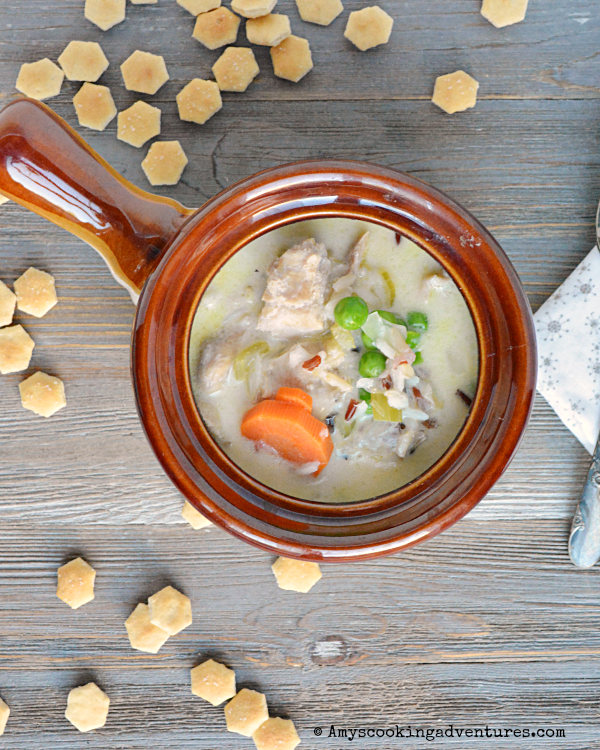 Chicken and rice soup would hit the spot on a chilly day! 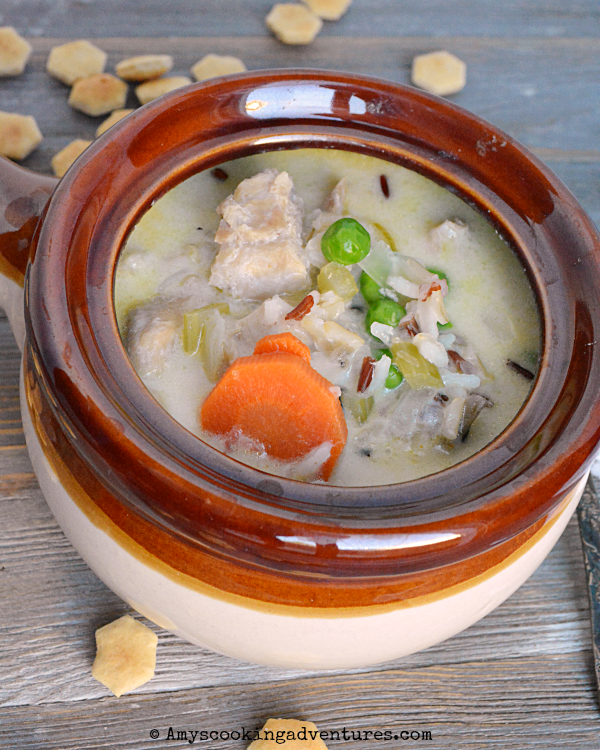 I knew that you were going to make wild rice soup....perfect for your neck of the woods!! I'm loving those big chunks of deliciousness. Yum. Yummm... this one is definitely right up my alley - and perfect for the cooler weather.